Today we are going to review a classic Bordeaux blend from the “left bank” – Haut-Médoc 2014 from Sacre Royal. 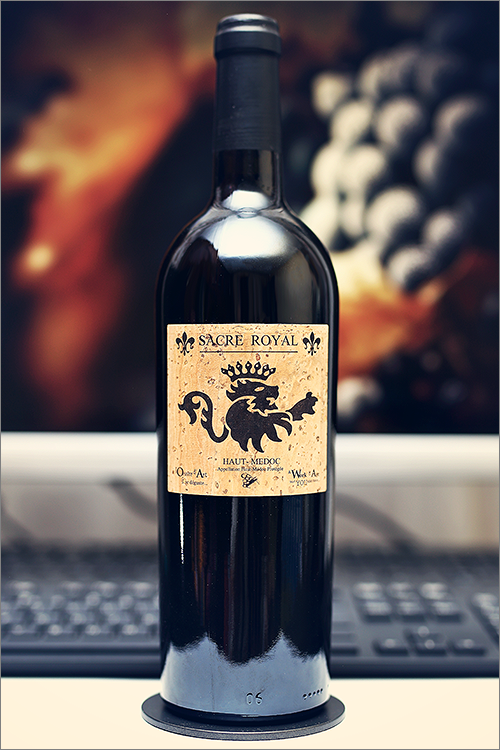 This wine is a blend of merlot, cabernet franc and cabernet sauvignon grape varieties, one of the most copied blending formula all over the world. Even though the “left bank” blends are based mostly on the cabernet sauvignon variety, which is usually accounted for more than 60% of the blend, this particular wine is based mostly on merlot and cabernet franc, which is quite a rare-find. Médoc area is known for its gravelly soils and graphite-driven red wines, which are considered as some of the boldest and most tannic of Bordeaux wines, perfect for aging or matching with red meat, but enough theory, let’s get straight to the tasting and find out how good this wine is! Noble and elegant garnet color, with bright ruby hues towards the rim of the glass. The nose is strong, filled mostly with ripe black fruits: sour cherry, blue plum, black cherry, blackcurrant, blackberry, blueberry, lolyberry, black raspberry, black mulberry and ripe marionberry. An instant later the nose is filled with noble notes of soil dust, nutmeg, black pepper, white pepper, black tea, tobacco, roasted wood and some subtle hints of allspice. The wine is extra-dry, with high alcohol level, high acidity and firm tannin. It feels bold, firm and expressive, with a nuanced tannic grip on the palate. This is a quite seedy, angular and astringent wine, as it tastes fruity, structured and nunced. The wine has a fair overall balance between fruit and wood. It has a long finish and an balanced, crisp and seedy aftertaste. This is definitely a great Wine of France and the overall rating says the same, with 90.8 points scored it is right there, among the best wines we’ve tasted so far. Please click on the chart icon on the left in order to get to the wine rating page, where you can find all the wines we’ve tasted to date. Conclusion: this is a quite a tart and youthful wine, that has yet to reach its prime form, as it requires at least a couple more years of bottle ageing (3 to 4 more years will suffice) due to its overwhelming acidity. It has an appealing tannic grip on the palate, with a fine-textured character on the mouthfeel and a touch of alcoholic warmth showing through. This is a wine that requires time to round up it’s angularity and roughness, therefore we would recommend to pair it with spicy and fat-rich meat dishes, like for example a pan-seared filet mignon with garlic and herb butter or a butter-roasted beef tenderloin with horseradish and caramelized onions in order to better complement those grippy-spicy notes in the wine. Salute! Just bought one bottle. Will buy the rest of the case tom.